Our following Home Chef reviews include the unboxing and cooking process of each meal, plan options and prices, similar meal delivery services, and our opinions on the service. You’ll also find the best part – coupons! Home Chef isn’t the only meal kit out there! Our list of food subscription boxes shares many more of the top options (including boxes made for particular diets). As delicious as they are, homemade meals are one of the most time consuming tasks. I’ve recently discovered meal delivery kits that help save a little bit of time! Home Chef is a food delivery service that brings you the ingredients you need to create up to three delicious meals each week, right to your doorstep! They provide fresh, pre-measured ingredients and easy to follow recipe cards in their weekly boxes. In my Home Chef reviews, I will share photos and descriptions of the meals I received, and I will also let you know if they were easy to prepare. I will tell you all about the food quality, if it was worth the price, and more. This article will introduce you to what Home Chef has to offer and how it works. I’ll also guide you through the order process, pricing, coupons, and similar subscriptions. The Home Chef website is pretty informal and very similar to the sites of other meal delivery kit companies. Their homepage outlines how the service works, and provides snippets from their social media. If you need to reach out to the customer service team, their phone number and hours are laid out in the bottom right-hand corner of the website. You can also find their email in the FAQ. 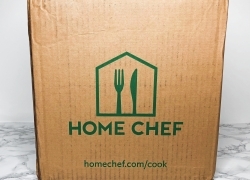 Home Chef reviews will emphasize one thing – signing up for their services is as straightforward as it gets. All you have to do is choose the plan you wish to receive and proceed to checkout. Here, you can choose from a few dietary preferences, such as the option to exclude certain meats, wheat, milk, soy, nuts, mushrooms, etc., as well as choose low-carb or low-calorie meals. Although the Home Chef menus provide a lot of options, if you try to select too many preferences, there won’t be any recipes to fit them. So, you should only select one or two of them to get the best results. As soon as you’re done with that, you need to provide your information and select the number of meals you want to receive. You can choose to receive weekly, bi-weekly, or monthly deliveries. Another great option they have is the ability to skip a week or cancel anytime, so you’re not committed to this subscription once you sign up. 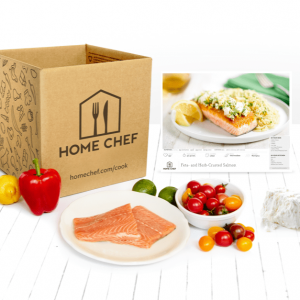 Home Chef is pretty different compared to many of the subscription boxes I had been subscribing to when I discovered it. Since I had never heard of a meal kit before, I was confused as to how they can ship perishable ingredients through the mail while still keeping them fresh. It didn’t seem very safe to me, which is why I was hesitant to try them out. 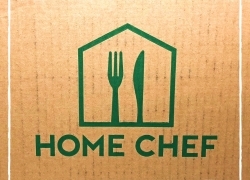 However, while compiling this Home Chef review, I found that they use specially-designed refrigerated boxes to ship their ingredients. They’re aligned with water-soluble, cool gel packs to keep your food refrigerated. Plus, the boxes are fully recyclable! Finally, they ship their boxes through FedEx. Boxes can be delivered between Tuesdays and Friday, and you can pick which day is most convenient for you. What’s more, you don’t even need to be home to sign for a delivery! They’ll leave it right at your doorstep, which is especially convenient for people like me with busy lives. The menus at Home Chef rotate each week, and there is a total of fifteen different recipes to choose from. Three of these meals are always vegetarian, while the rest feature different types of meat or fish. Their meals are a lot healthier than eating out since they’re made of fresh ingredients. They even provide all nutritional information in their recipe cards! If you’re following a dairy-free or vegan diet, this probably isn’t the best subscription for you. You could substitute ingredients, but it seems silly to pay the premium for this service and then still have to buy more groceries. There are a few vegan meal delivery kits you should look into if you’re interested. The two I know of are Purple Carrot and Sun Basket. I’ve tried the latter and it was delicious! If you want to find out more about the offer of this subscription service, I encourage you to check out my Sun Basket reviews. Not only you will see if this box is a good fit for you, but you might also come across some coupons and deals to help you save. The pricing for Home Chef depends on how many meals you choose to receive and how many people you’re cooking for. Most of the meals cost $9.95 per serving and delivery is free for orders over $45. Otherwise, if your order costs less than $45, you will be billed $10 for delivery. There are also some featured meals that will cost a little less if you choose them. As for coupons, there’s an advertised Home Chef coupon for $30 off your first order and $10 off the second. They make this deal well-known for new members right on their website. It literally popped up when I opened their site. If you know somebody who’s already a subscriber, you can use their invite code to get the same $30 discount while giving them one as well. I’m not sure how long these coupons and deals will last, so be sure to use them right away! Otherwise, in case you miss them, my next review will also feature any coupons I receive in my box, email, etc. Although everything seems fine for me so far, I should also mention that there’s a number of various negative reviews and complaints. I don’t think it’s particularly the company’s fault though, I’ve noticed this to be a common thing with meal delivery kits. These companies should definitely be targeting ways to avoid the common problems that people have with their subscriptions. For example, when browsing Home Chef reviews, Yelp ones stated that customers received their boxes later than promised which caused some (or all) of their ingredients to spoil. This is hard to avoid because they ship through FedEx and there’s always the possibility of delays or delivery problems. When I subscribed to Sun Basket, my first shipment was late by a day.